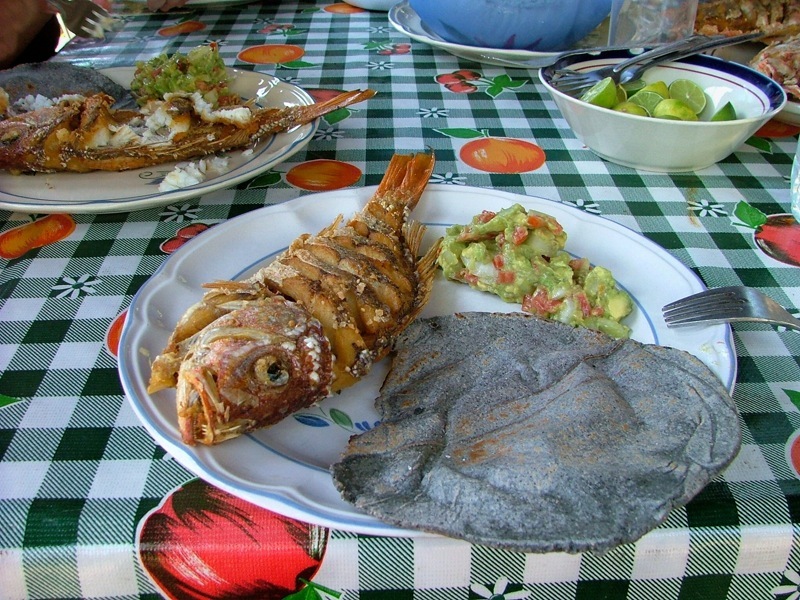 Barra de Potosi is famous for its enramadas. These are open air restaurants set along the beach. The roofs are coconut palm leaves, and the plastic tables and chairs sit directly in the sand. Roughly fifteen enramadas line the beach along the edge of the lagoon and around towards the bay. They open sometime around 9 in the morning and close at dark. 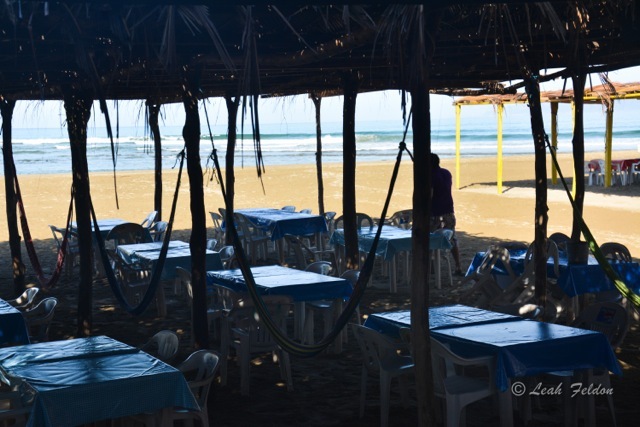 Their specialty is fresh seafood and particularly on weekends and holidays, numbers of Mexican families spend the entire day camped out a table and frolic in the very gentle water. A favorite for breakfast is Teresita. La Condesa which is the one farthest north has a great ocean view and is popular with gringos, but we think it is worth exploring and finding the one you like best. By the way, it is illegal to commercially fish for marlin and sailfish in Mexico. Nonetheless they often turn up on restaurant menus. Those billfish are the mainstay of the sport fishing industry and commercial exploitation has decimated their populations. 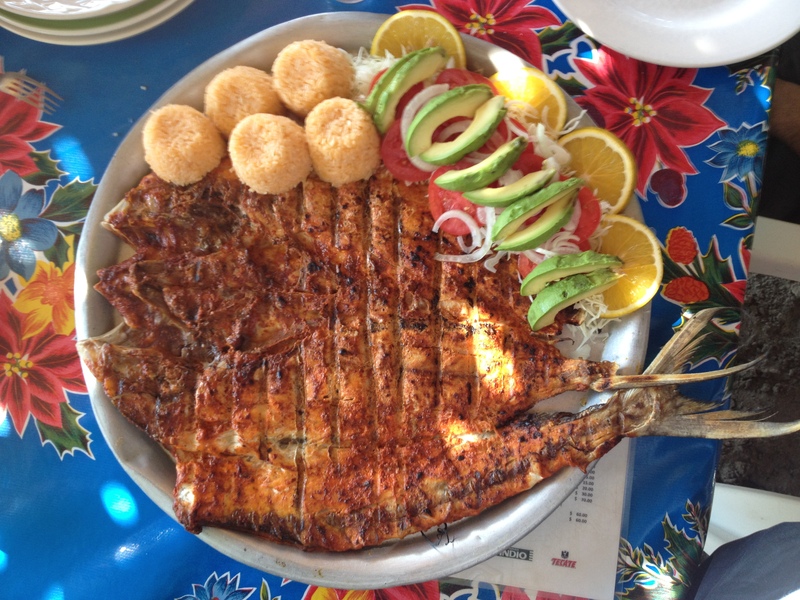 We would encourage you to try huachinango (a red snapper), sierra (Spanish mackeral) , robalo (snook) and pargo (another snapper) which are legal and delicious. Chari’s – 8:30a.m. to late afternoon. Located just past the Jesus Cristo store in the village, Chari offers egg dishes and various lunch plates at reasonable prices. She also sells fresh fish, meats and shrimp – or will prepare them for you to take out. There are several simple rustic restaurants that open in the village after dark. 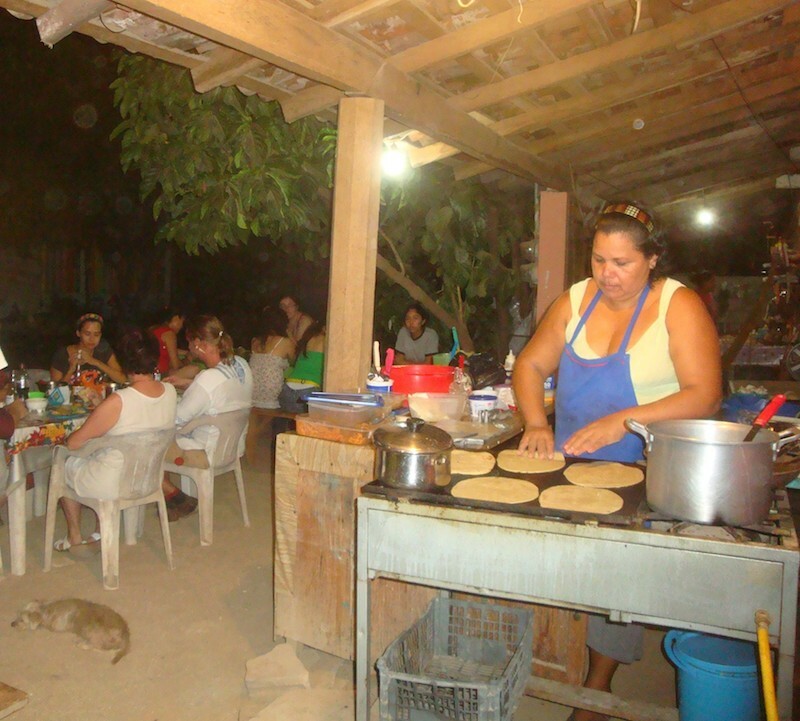 The food is cheap and delicious and you get a front row seat to life in a small Mexican village. They are one of the special charms of the area. These spots come and go but here are the most established. We enjoy Chayo’s on the left corner of the middle street just across from the kindergarten. Her specialty is quesadillas: big tortillas made by hand and grilled with an assortment of cheese and other fillings. She has vegetarian options as well as meat and chicken. And on the right side near the far end of the main street is Dona Emi’s – the original and now largest dinner spot. She offers the best pork tacos in the world. Solecito Hotel: hosted by Blanca Romo – Elegant boutique hotel with seasonal restaurant – by reservation only. This is within walking distance of the village of Barra de Potosi. Open for breakfast, lunch and dinner. Contact: phone or WhatsApp- 755 55 75157 or email reservaciones@bungalows-solecito.com. Villas don Manuel – Minimum 4 people and reservations required 24 hours in advance. You can discuss the menu with them. Lovely garden setting. Contact: Toby and Claudia at 755 559 7612. Chula Vida – They are open in the afternoons and usually in the evenings. Call ahead to double check or make a reservation. 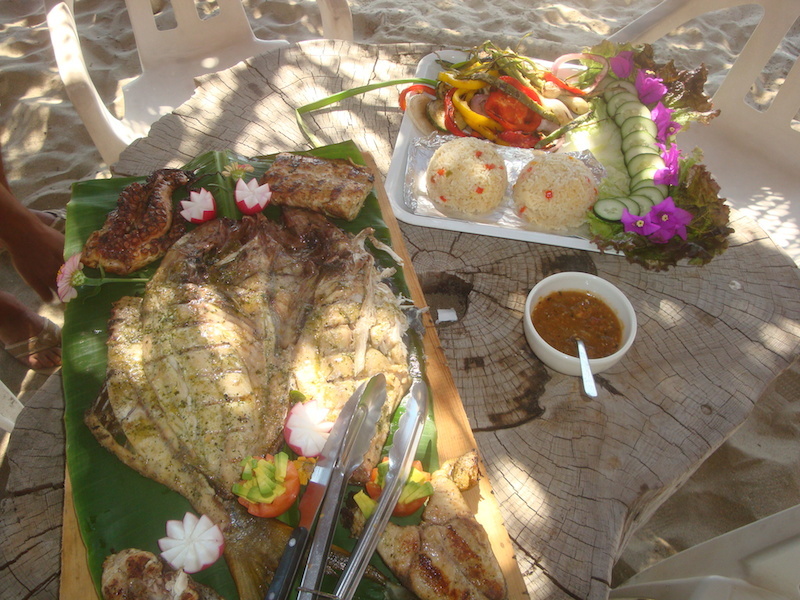 They prepare outstanding fresh fish and octopus on a wood grill, usually offered with rice and mango salsa, caesar salad and grilled vegetables. There are other options as well. Sometimes they have sushi and host salsa classes. Contact: Jorge and Lisette at 755-108-1038. Lagartos – Open from 10am until 11p.m. Best to call in advance. Fish, seafood, steaks, salads in a great beachfront setting. Contact: Levy Ramirez 755 550 3042. Marlin- Just north of Lagartos. 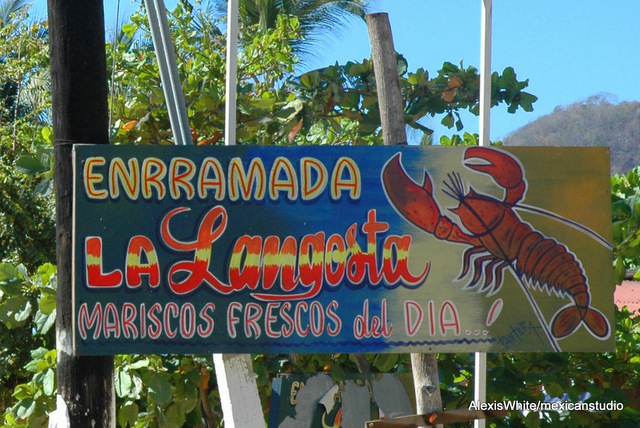 This is a beachfront enramada that serves exceptionally fresh seafood, often including lobster and pargo. It is normally open during afternoon comida but if you call in advance, they will serve dinner and try to obtain fish to order. Contact Jose Angel at 755-111-0483 or 755-113-2863. 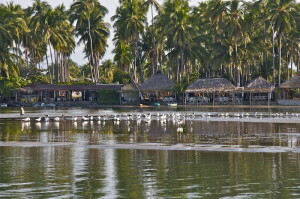 Brisamar- Similar to Marlin, this is a rustic beachfron enramada in Los Farrallones. Very friendly service and located on a pretty stretch of beach. Normally open for comida in the afternoons. Marea- Multistory condos just past beach road bend below the airport. Advance reservations required.